Corned beef and pastrami on rye with a side of heroin. 12 years ago today I said goodbye to my brother, who after being in a coma for days following a drug overdose, finally let go and passed away. This date will always be difficult, though some years I manage it better than others. The first year was the most horrible, because as my mother and I had ended our evening celebrating my brother by dining on some of his favorite foods, we learned that his beautiful girlfriend Ashley, had overdosed earlier in the day. I can’t possibly communicate the devastation we felt yet again, and then basically had to have the same funeral all over again a year later. Ashley’s parents were in New York a couple weeks ago. I hadn’t seen them in 11 years and to be honest, I was dreading it. Sure, we are connected on Facebook, and “likes” here and there and words of love and support have been shared online, but I just couldn’t imagine sitting with them again, face to face. I met up with them and my mother, after allowing the parents to share some time between them, and it was hard, and easy at the same time. Ashley’s parents looked great, and they were so sweet and lovely. They asked after my children and we chatted about their son, and their business, and what restaurants they should eat at while they were in the city, and you wouldn’t have known there were ghosts sharing the table with us, but they were there. Jonathan and Ashley, remembered in life, vibrant and charismatic, and missed by all of us. One of the themes that gets thrown around in the world of drug users and recovery, is powerlessness. It’s a tough word, and a word that sets me off, because I don’t like being powerless. That motivated me to change the word in my vocabulary, at least in this milieu, because I spent part of my day today, in honor of Jonathan and Ashley, gaining power. 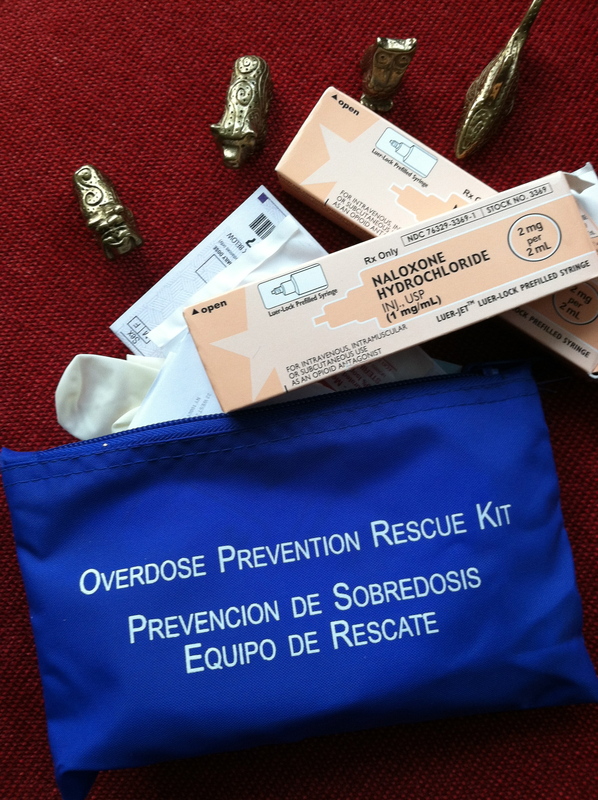 I am now officially trained and have the power to train others, in how to reverse an overdose. If you, or anyone you know, uses heroin or opioids (i.e. morphine, hydrocodone, oxycodone), you need an Overdose Prevention Kit, and now I have the capability of getting you one, and training you in how to potentially save someone’s life. You don’t have to be powerless either. Feel free to reach out to me privately at julie@totemtamers.com if you have any questions. I am forever grateful to the amazing crew at http://harmreduction.org, for answering all my questions, teaching me, and helping me grieve in a powerful and productive way. Now, there’s a corned beef and pastrami on rye with my name on it, and my brother would have loved it! The most profound irony in all of this by the way, is that my stepfather, Jack Fishman, invented naloxone. In honoring my brother and Ashley, I also honor Jack’s legacy.